Protema electric lifter can be used as box lifter, sack lifter, reel lifter, drum lifter, crate lifter, bale lifter, tyre lifter and more. Lifting, rotating, turning or moving things are easy with Protema electric lifter. Protema electric lifter has been successfully marketed around the world for many years. During that time we have experienced just about every problem regarding handling of lighter goods. Therefore we will almost certainly have a lift for your needs. Protema electric lifter is manufactured with an emphasis on functionality, flexibility and reliability. They are extremely lightweight and are battery driven with a built-in charger. 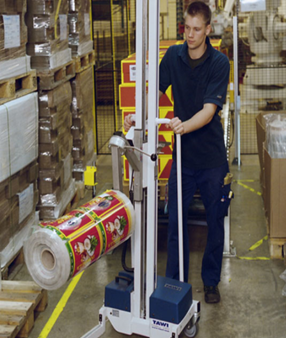 Protema electric lifter each offers a choice of lifting heights and lifting capacities. With the Protema electric lifter we strive to find solutions to easier lifting. Pushing objects on or off a platform is made much easier by adding rollers on the front and sides of the platform. In some cases, rollers have been incorporated into the complete platform surface. There are many more examples of Protema tools that make lifting easier.